The concept of roughing it in nature has taken on varying levels of disconnection from modern civilization. For many, the true manner to embrace the natural wonders of this planet are to enter with only essentials such as a tent for camping, a comfortable pair of shoes for hiking or a fishing rod for angling. An alternate and completely opposite interpretation to basking in nature consists of Wi-Fi connections, electronic fish finders and recreational vehicle decked out with all the creature comforts of home. In a world where glamping has become such a common form of summer vacationing, would it serve as a surprise that one of the world’s most popular names in super-luxury motoring could connect to the outdoor spirit? While Bentley owners have been used to experience a high-end picnic with custom-created, bespoke accessories, the premium brand now has something for fly fishing enthusiasts with their all-new Bentayga all-wheel drive crossover vehicle. The Bentayga Fly Fishing by Mulliner is specially-fitted with a removable outdoor set tailored to weekend or vacationing anglers. 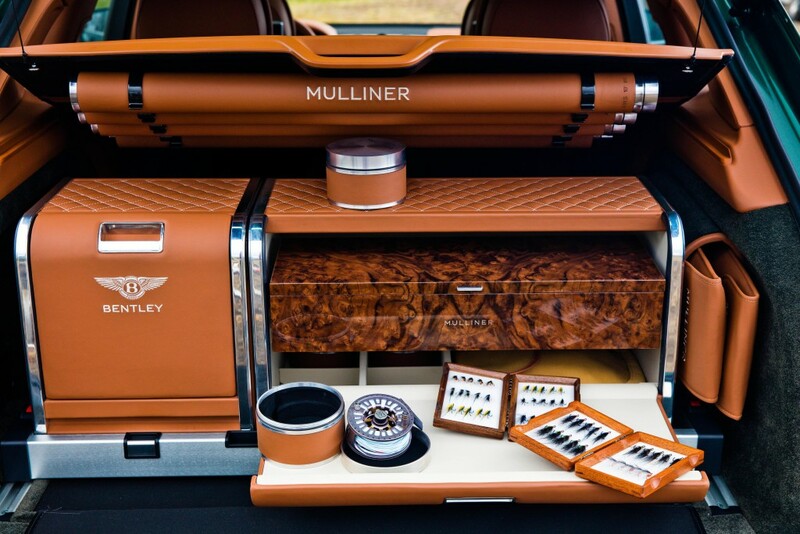 Decked-out using Bentley’s bespoke division’s unflinching devotion to craftsmanship, Mulliner found a way to store fly fishing gear in a manner appropriate for a high-luxury utilizing premium materials such as Saddle leather and fine wood. Four special tubes containing fishing rods are located under a privacy cover, leather bags store landing nets and a master tackle station, refreshment case as well as a waterproof wader-stowage trunk. Incorporating a Burr Walnut veneered drawer for a variety of fly fishing tools and hooks, the master tackle station is located above four machined solid aluminum reel cases. The Bentayga Fly Fishing by Mulliner refreshment case is installed on the same sliding tray as the master tackle station. Trimmed with Linen leather, the refreshment case is designed to hold unique Mulliner fine-china ware and three metal flasks. Food storage is also found in a separate compartment. Bentley understands the potential shame of allowing waders and boots to discolor or damage the deep pile carpeting inside the Bentayga. Serving as a waterproof yet stylish storage trunk for wet fishing gear, the compartment lined with hard-wearing neoprene allows boots and/or waders to be securely tucked away. Also insuring the cargo area of the crossover resists dampness, an electronic dehumidifier is included inside the Bentayga. Waterproof floor and rear sill protection covers are incorporated into the Bentley Bentayga to better resist the less than luxurious outings for the vehicle. The high-fashion fishing module of the Bentayga Fly Fishing by Mulliner can be removed when not in use. 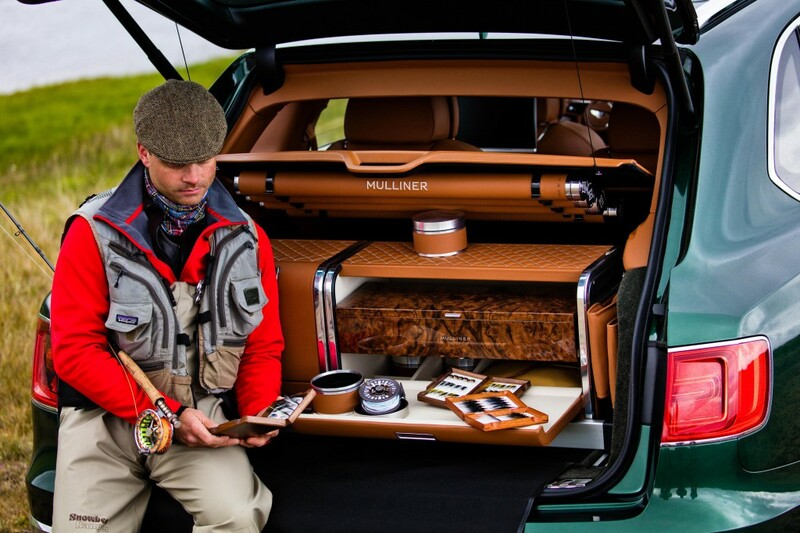 The Bentayga Fly Fishing by Mulliner is only one example of the many heavily personalized options offered from Bentley as part of their assortment of bespoke accessories. “The Bentayga Fly Fishing car showcases the breadth and level of detail a customer can expect from Mulliner. This is an individual bespoke solution and our skilled craftspeople can design elegant and exquisitely executed bespoke solutions to complement any customer lifestyle or hobby,” said Director of Mulliner Geoff Dowding. 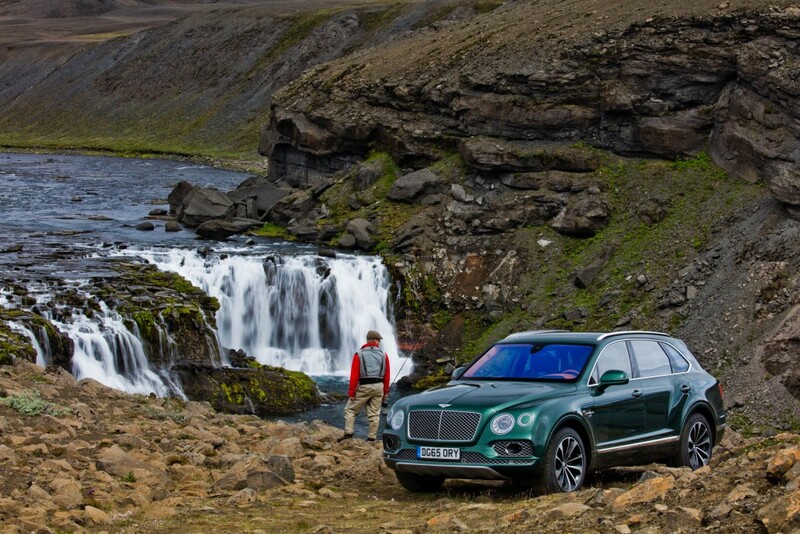 While the Bentley Bentayga is already a creation used for trekking through uncharted territories for the British luxury vehicle brand, The Bentayga Fly Fishing by Mulliner may initially appear like a city slicker but may exist with a deep-seeded sportsman desire. Do you like Bentleys? Check out some of the coolest customized ones HERE.